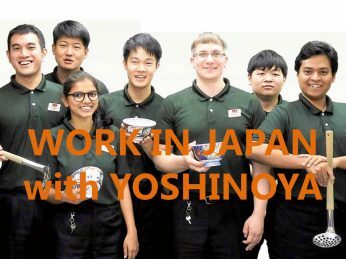 Yoshinoya Holdings sets a goal to hire 100 global employees by 2020, and they have steadily hired the new members of global talent at present. We’ll introduce Mr.Chanon who is hired by Yoshinoya Holdings in April 2018 following the interview of Ms. Sutharat (Thai) hired in April 2016. Mr. Chanon Limpatiyagorn from Yoshinoya Holdings Co., Ltd.
■ Education: Graduated from the Department of Food Science and Technology, Faculty of Agro-industry, Kasetsart University in Thailand, May 2016. <Biography> He was fascinated by Japan after staying in Kyoto for 3 weeks by International Exchange Program of Kyoto University in 2013. 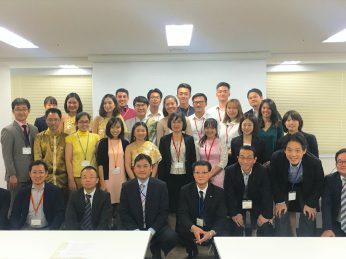 In February 2016, he joined the Yoshinoya Job Seminar at Kasetsart University. 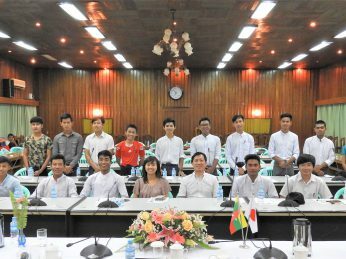 After graduating from university he worked as a management internship for business innovation project at Singha Business Course (Singha Corporation) for 3 months. 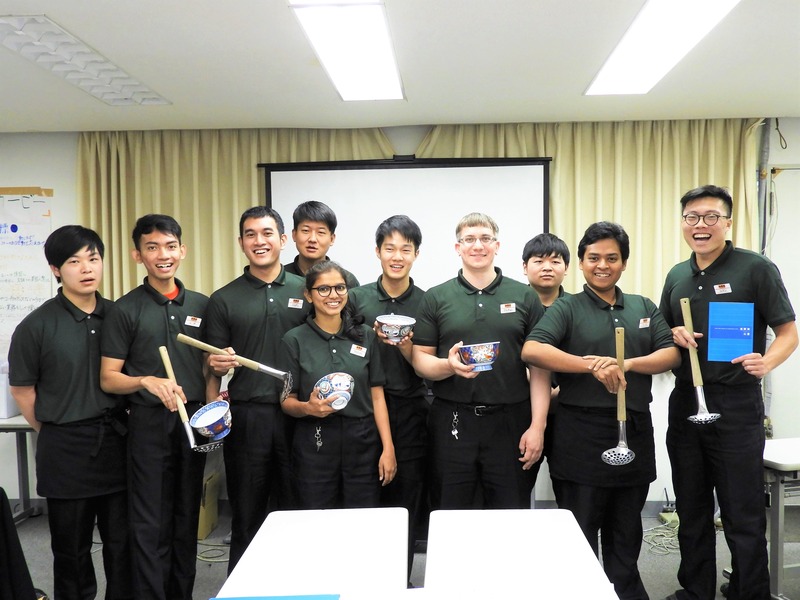 After that, he engaged in research on protein from edible bugs and insects as a short-term contract employee at AETS Thailand. He entered Thai Waseda Japanese Language School in January 2017. He studied Japanese intensively for one year and three months at his own expense, and get Japanese Language Proficiency Grade 3 in January 2018. 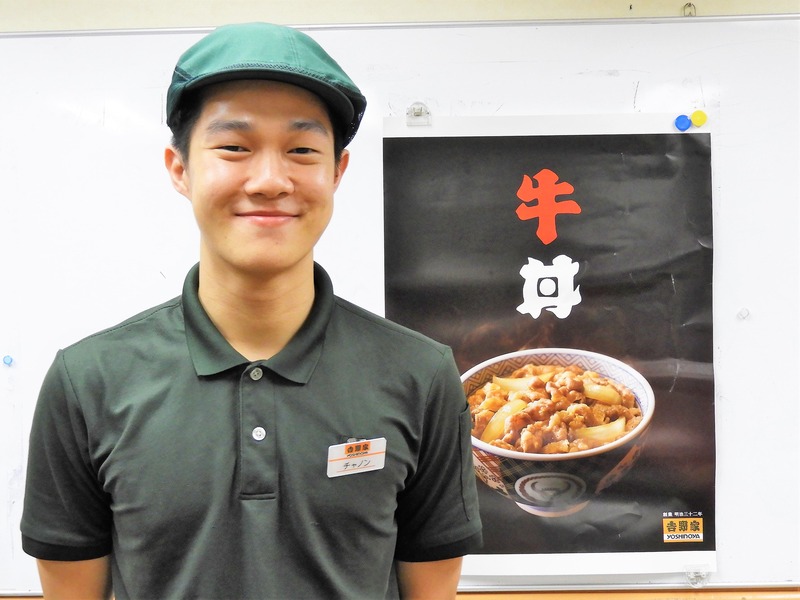 He came to Japan in March and have joined Yoshinoya Holdings since April as a full-time employee. ◆ What motivated you to join Yoshinoya? 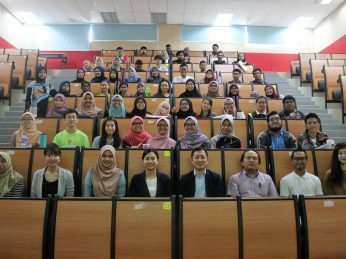 In 2013, I participated the International Exchange Program of Kyoto University for 3-weeks. Then, I was fascinated by Japan. Japan is beautiful, Japanese food is delicious, people are also kind, so I came to have a feeling of “I would like to work in Japan in the future”. After the 3 years in May 2016, I knew that Yoshinoya are looking for a position of work in Japan by the bulletin board and the Facebook page of our university. ◆ How did you study Japanese? I graduated from university in May 2016 and worked for a few companies and decided to study Japanese in January 2017. I entered Thai Waseda Japanese Language School in January 2017 and studied Japanese for 1 year and 3 months. The tuition fee was about 600,000 yen (about 200,000 Bahts), but I paid all the tuition fee with my own savings. It took time, money and a lot of effort to learn Japanese, but I studied hard in order to work in Japan. I got a Japanese Language Proficiency Grade 3 in January 2018, and I finally came to Japan to work in Yoshinoya in this April. ◆ Have you had any difficulties before coming to Japan? Learning Japanese was the hardest thing. 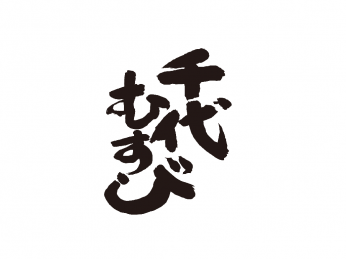 The conversation with native Japanese is fast and Kanji (Chinese character) is also very difficult to write. I was about to quit learning Japanese many times since Japanese is so difficult for me. However, I never gave up. I studied Japanese everyday by group work, Kanji test etc. for 6 hours at school, and reviewed 2 to 3 hours everyday. ◆ What kind of place do you like in Japan? I like the way that the quality of life is high in Japan. I think that the standard of living in Japan is higher on average than in Thailand. For example, public transport systems are in good condition. Moreover, I can save money by working in Japan, but I want to spend it for learning more about Japanese and Japanese way of life. From now on, I will learn about Japanese stocks, Japanese society and Japanese companies through stocks. ◆ What do you do on holidays? Also, I love to run. I participated in the jogging community called Adidas Runners where I could make Japanese friends. This community is located all over the world. I also participated in Thailand before. I contact my family and friends in Thailand by SNS (Facebook Messenger & LINE) etc. I received their support when I moved to Japan to work for Yoshinoya. ◆Please tell me about the current job. I’ve had training at the training center for the first 4 months at Yoshinoya in Tokyo. We learn the manuals with guide books and practice how to take orders by handy, also have practical training of putting meat and onions on bowls in the kitchen. We also have training at the stores during these time. 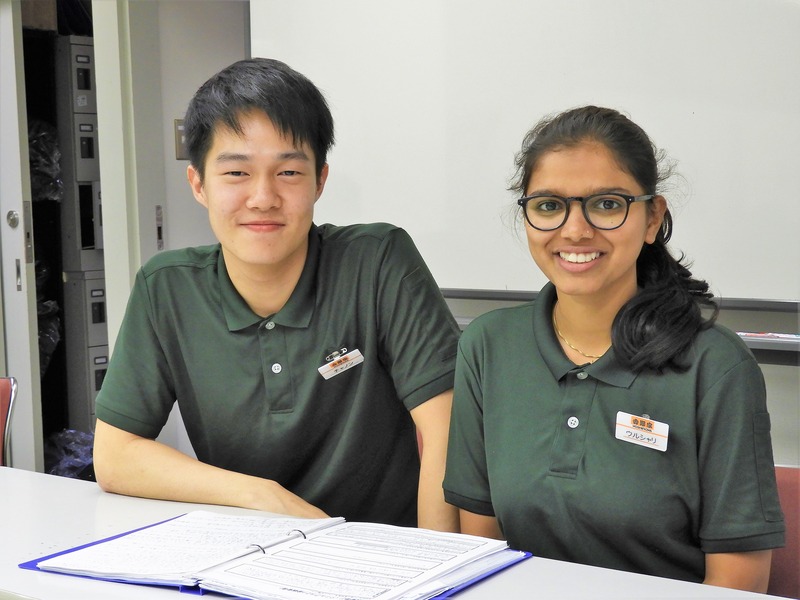 After 4 months, we take an examination and become an assistant manager. ◆ Have you had any troubles at your work? I can’t understand Japanese at the store sometimes because what I learnt and daily-life Japanese is different and the speed of native Japanese is also fast. However, I’m able to serve foreign customers well because I can communicate with them in English. When I am in trouble, I try to search the words which I don’t understand by Google translate, dictionary application in smart-phone. I also try to get accustomed to work by repeating the same thing over and over again. At first, I was puzzled by the difference between Japan and Thailand’s hospitality. In Japan we honor our customers, but in Thailand customers and clerks are in the same level. Now, I got used to Japanese hospitality and customs. ◆ What is your future goals at work? First of all, I want to master my current job for a year and be independent. In the future I would like to take advantage of my major I’ve studied so far and engage in developing new products and new menus for Yoshinoya. I’d love to keep working in Japan. I also like to talk and share ideas with others, maybe if there is an opportunity in the future, I would love to work at the global division. 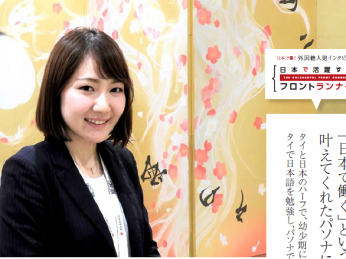 ◆The message to who wants to work in Japan! Let’s get out of your comfortable zone! I think it is important to always put yourself in a new environment and expand your possibilities. You won’t be able to learn anything unless you live the different places and challenge new things. I’ve been challenging to achieve my goal of “working in Japan” so far. Learning new fields broadened my horizons. 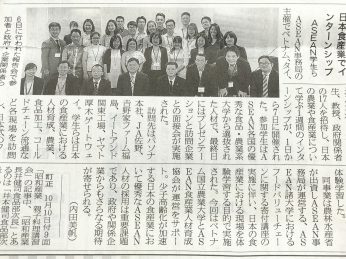 It’s joyful to share new ideas and different cultures not only to Japanese but also to the global staffs at Yoshinoya. It is important that you never give up for making your dream come true! Just step out of your comfortable zone and challenge yourself!